This guide presents a reference architecture for Pivotal Cloud Foundry (PCF) on Amazon Web Services (AWS). 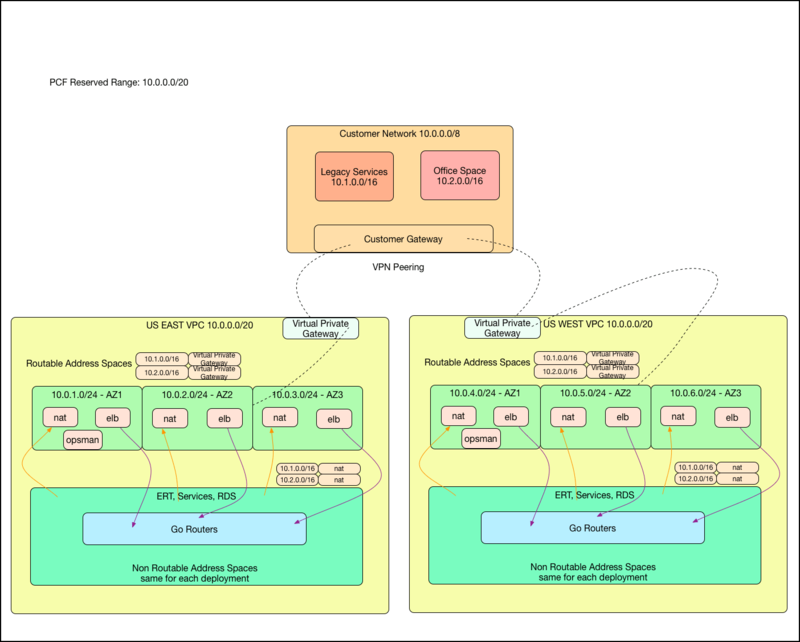 This architecture is valid for most production-grade PCF deployments using three availability zones (AZs). See PCF on AWS Requirements for general requirements for running PCF and specific requirements for running PCF on AWS. Pivotal provides reference architectures to help you determine the best configuration for your PCF deployment. 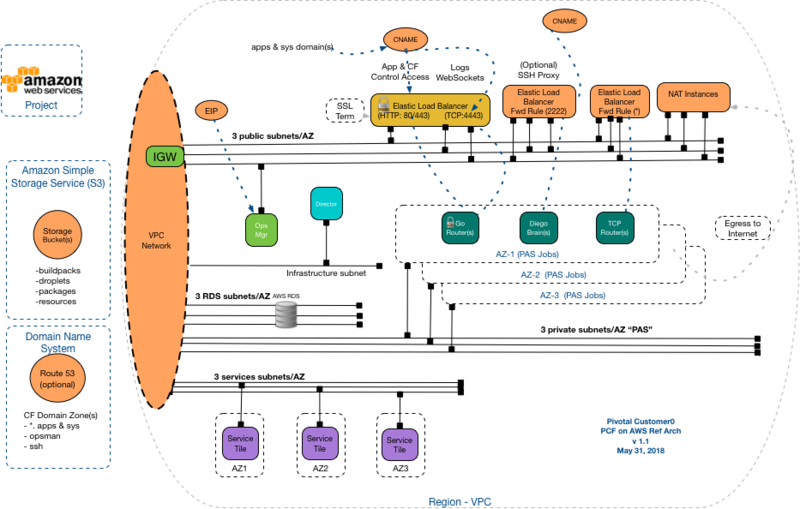 The following diagram provides an overview of a reference architecture deployment of PCF on AWS using three AZs. Note: Each AWS subnet must reside entirely within one AZ. As a result, a multi-AZ deployment topology requires a subnet for each AZ. The following table lists the components that are part of a base reference architecture deployment on AWS with three AZs. Using Route 53 to manage domains is optional. Ops Manager Deployed on one of the three public subnets and accessible by FQDN or through an optional jumpbox. BOSH Director Deployed on the infrastructure subnet. Elastic Load Balancers - HTTP, HTTPS, and SSL Required. Load balancer that handles incoming HTTP, HTTPS, and SSL traffic and forwards them to the Gorouters. Deployed on all three public subnets. Elastic Load Balancers - SSH Optional. Load balancer that provides SSH access to app containers. Deployed on all three public subnets, one per AZ. Gorouters Accessed through the HTTP, HTTPS, and SSL Elastic Load Balancers. Deployed on all three Pivotal Application Service (PAS) subnets, one per AZ. Diego Brains Required. However, the SSH container access functionality is optional and enabled through the SSH Elastic Load Balancers. Deployed on all three PAS subnets, one per AZ. TCP Routers Optional feature for TCP routing. Deployed on all three PAS subnets, one per AZ. CF Database Reference architecture uses AWS RDS. Deployed on all three RDS subnets, one per AZ. Storage Buckets Reference architecture uses 4 S3 buckets: buildpacks, droplets, packages, and resources. Service Tiles Deployed on all three service subnets, one per AZ. Admin Role: Terraform uses this IAM role to provision required AWS resources as well as an IAM user. IAM User: This IAM user with IAM security credentials (access key ID and secret access key) is automatically provisioned with restrict access only to resources needed by PCF. EC2 Instance Quota The default EC2 instance quota on a new AWS subscription only has around 20 EC2 instances, which is not enough to host a multi-AZ deployment. The recommended quota for EC2 instances is 100. AWS requires the instances quota tickets to include Primary Instance Types, which should be t2.micro. The following table lists the network objects in this reference architecture. 3 x (/24) RDS subnets (Cloud Controller DB, UAA DB, etc. ), one per AZ. PublicSubnetRouteTable: This routing table enables the ingress/egress routes from/to Internet through the Internet gateway for Ops Manager and the NAT Gateway. PrivateSubnetRouteTable: This routing table enables the egress routing to the Internet through the NAT Gateway for the BOSH Director and PAS. For more information, see the Terraform script that creates the route tables and the script that performs the route table association. Note: If an EC2 instance sits on a subnet with an Internet gateway attached as well as a public IP address, it is accessible from the Internet through the public IP address; for example, Ops Manager. PAS needs Internet access due to the access needs of using an S3 bucket as a blobstore. Note: The extra port of 4443 with the Elastic Load Balancer is due to the limitation that the Elastic Load Balancer does not support WebSocket connections on HTTP/HTTPS. Load Balancers PCF on AWS requires the Elastic Load Balancer, which can be configured with multiple listeners to forward HTTP/HTTPS/TCP traffic. Two Elastic Load Balancers are recommended: one to forward the traffic to the Gorouters, PcfElb, the other to forward the traffic to the Diego Brain SSH proxy, PcfSshElb. For more information, see the Terraform load balancers script. It may not be realistic to request multiple routable /22 address spaces, due to IP exhaustion. Using different VPC address spaces can cause snowflakes deployments and present difficulties in automation. Only make the load balancer, NAT devices, and Ops Manager routable. PCF components can route egress through a NAT instance. As a result, operators do not need to assign routable IP addresses to PCF components. Inbound traffic from the datacenter should come through an internal load balancer. Outbound traffic to the datacenter should go through AWS NAT instances.